June 19, 2014 Conversation Starters: The Real Score Between Carla Abellana and Tom Rodriguez + More! 2 Nursing a broken heart? 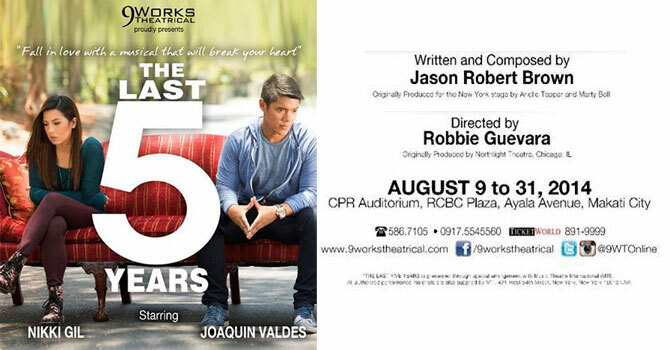 Y'all might want to drag your girlfriends to watch stage play "The Last 5 Years," starring Nikki Gil and Joaquin Valdes. The musical revolves around the five-year relationship of writer Jamie Wellerstein and actress Cathy Hyatt—where the story is told in reverse chronological order, starting from the time the couple broke up. Interested? The musical will be playing from August 9-31 at the CPR Auditorium, RCBC Plaza. To buy tickets, call 0917-5545560, 586-7105 or 891-9999. 4 Remember that really cool treadmill music video that OK Go did for their hit song, "Here It Goes Again?" Well, the American rock band just released their new vid for "The Writings On The Wall," and it's even better. The video makes use of optical illusions and it is G-E-N-I-U-S! Genius, we tell 'ya! Watch it below!